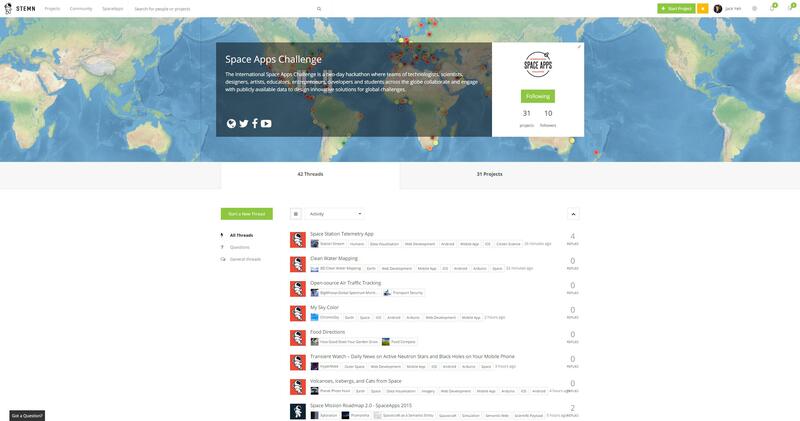 Forums for Space Apps teams to discuss and share ideas around their specific challenge(s). Over the hackathon, we'll be developing geo-location features for users to find projects using a Google maps interface. We made STEMN to promote more knowledge sharing and collaboration for Space Apps teams, and we hope we can do that for you! We're all tackling the same themes and challenges, so let's ask questions, share and discuss ideas, and build space, together. The world looks towards the ISS as a sign of international collaboration. We hope to carry forward that symbolic torch, and further the mission of the Space Apps Challenge for teams around the world to bounce ideas off each other, and add a little more "international mass collaboration". Over the hackathon, we'll be developing geo-location features which will allow you to find projects by location. We hope to complete this feature and make this feature opensource on GitHub by the end of the weekend.